Ladies Bespoke tailoring is all about proportion. Too much attention cannot be given to the question of seam placement and seam run, as the whole subject of good style and line is governed by the run of seams, to a greater extent than actual fit. A perfectly fitting and tailored garment is not necessarily one of good style unless the seam placements are in harmony with the figure and shape of the wearer. Using only the softest inner canvasses to make our ladies bespoke coats, ensures that the chosen cloth will drape beautifully over the chest and is soft to wear. When you have us cut and make you a jacket, you will feel amazing having something that is perfectly tailored, and has been specifically cut with an eye for line to your physique. The classic tailor-made style, it has a centre vent at the back, a sidebody gives the necessary shape at the waist, fronts are single breasted with pointed revers, and bust provision is introduced by shoulder and waist darts. WHY GET YOUR SUIT FROM US? 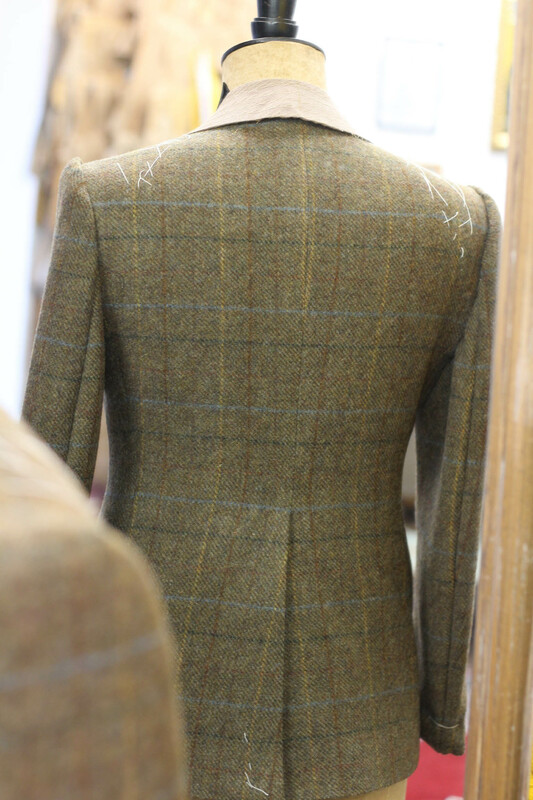 Our bespoke jackets take a minimum of 50 hours (10-12 weeks) to complete. If you have a specific deadline in mind, please get in touch. We would love to talk to you about your requirements or answer any questions. Fill in this contact form and we will be in touch as soon as possible, or visit the contact page.